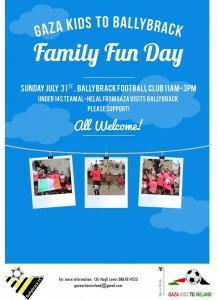 Join the GAza Kids To Ireland project this Sunday 31st July for the Ballybrack Kids to Ballybrack Family Fun Day. Help welcome Gaza’s Al Helal FC under 14s team to Ballybrack, Starting at 11am in Ballybrack Boys Football Club and includes a football match between Al Helal and Ballybrack, a bouncy castle, DJ, magician, Palestinian food and more. Organised by Gaza Kids to Ireland.